New video testimony shows Linda Hamilton’s personal story about how she applied Dr. and Master Zhi Gang Sha’s Soul Healing Miracles techniques before a stressful job interview, which helped her secure the job. Maryland resident Linda Hamilton tells how she was feeling very stressed prior to a job interview presentation before her longstanding biggest critics, but after practicing natural healing and sound healing techniques from bestselling personal development author Dr. and Master Zhi Gang Sha, she aced the interview and was hired for the job. 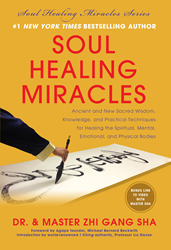 In his national bestselling new book, Soul Healing Miracles, Dr. and Master Zhi Gang Sha harvests a tremendous healing energy from the Divine and pre-programs each book so that readers experience the soul healing possibilities just from reading, meditating and touching the book. For the first time, Dr. and Master Sha's own Source Ling Guang (Soul Light) Calligraphy art is included inside the pages and carries matter, energy, and soul of The Source. The first book in the Soul Healing Miracles Series was published November 11, 2013, with great acclaim debuting on USA Today, Wall Street Journal and Amazon bestseller lists. When a painter creates an art piece, the viewer can sense the emotion and feelings within each stroke of the artist’s brush, every dab of paint, every swoosh of his or her hand. With Dr. and Master Sha’s Source Ling Guang Calligraphy art scroll, because he is a channel who receives blessings from God, every brush stroke carries a soul blessing that is transferred into the paper and its energy radiates out to anyone who witnesses it, or has the unique opportunity to meditate in front of it. When a person adds this large scroll artwork into their home or office, the frequency and energy of that space will change and anyone who enters that room will receive blessings for health, finances, relationships, business, creativity, intelligence, and more. Already, thousands have flocked to retreats, events and workshops to experience the healing blessings that Master Sha’s Source Ling Guang artwork radiates to every person who witnesses it, and many are sharing their profound experiences on video, social media sites, and with friends and family. Dr. and Master Zhi Gang Sha has more than 100,000 followers on Facebook (http://www.facebook.com/DrandMasterSha) and an additional 250,000 devotees worldwide. The Soul Healing Miracles™ Chanting Channel (http://www.drsha.com/tv) fosters a soul-healing community to learn and use chanting and soul songs for personal, spiritual, mental and soul development, 24/7. Dr. and Master Sha’s Soul Healing Miracles™ Daily Live TV airs everyday on Livestream, 9 a.m. PT, 12 p.m. ET on http://www.DrSha.com. Everyday people all over the world are experiencing personal Soul Healing miracles and sharing their video testimonials so that others can benefit from these powerful and life-changing results on http://www.youtube.com/zhigangsha. Dr. and Master Sha is author of more than 10 New York Times bestselling books in the Soul Power Series published by Simon & Schuster (Atria Imprint). His new book series, Soul Healing Miracles, is published by BenBella with the first book entitled Soul Healing Miracles: Ancient and New Sacred Wisdom, Knowledge and Practical Techniques for Healing the Spiritual, Mental, Emotional and Physical Bodies. Released in November 2013, it was an instant national bestseller landing on the USA Today, Wall Street Journal and Amazon bestseller lists within days of publication. In this groundbreaking book, Soul Healing Miracles, readers learn sacred wisdom, Source meditation and mantras to further their spiritual journey. Dr. and Master Sha is creating a global self-healing movement and his newest book empowers people to self-heal and to help others by using the healing energy from The Source Ling Guang (Soul Light) Calligraphy art printed in the book.